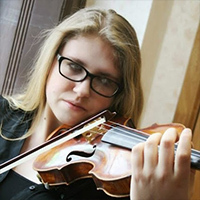 Laurel Gagnon, a native of New Hampshire, began her violin studies at the age of three. Currently, she is studying with Ben Sayevich at Park University's International Center for Music. She was recently named a 2015 Naftzger Young Artist Award winner and a Sigma Alpha Iota scholarship recipient; she also won scholarships at the Kansas City Music club Auditions in 2016 and 2017. Gagnon made her solo debut at the age of twelve, performing Sarasate's Zigeunerweisen with the New Hampshire Youth Symphony. As a high school student, she performed major concertos with both the Granite State Symphony Orchestra and the NH Philharmonic. In 2015, Gagnon appeared with the Kansas City Chamber Orchestra and students of Ben Sayevich's violin studio, performing Vivaldi's Four Seasons. In 2016, she was once again invited to appear with the Kansas City Chamber Orchestra, performing Wieniawski's Polonaise Brilliante No. 4. Gagnon has performed in various masterclasses for artists such as Schmuel Ashkenasi, Tong Wei Dong, Ann Epperson, Noah Geller, Alèxi Goribol, Midori, and the late Joseph Silverstein.